Just scroll down. It’s right underneath that button you pushed to follow me on Twitter. You did push the button to follow me on Twitter, right? Anyway, just wanted to highlight a couple for you. AllEars is a fabulous wealth of information–everything from the latest news about the park to menus for each restaurant. It also has great information about trip planning, since as I have mentioned, I cannot tell you which hotel to stay in since I live here. The link is for the Disneyland blog, encompassing mostly Disneyland but also exciting other events. This blog is a fabulous guide for doing Disneyland with young children. For Disney collectors, this blog has all kinds of cool stuff. My personal most recent favorite is the small plastic toy of Mickey jumping out of Sleeping Beauty’s Castle. That’s not the good part. The good part is that “Disneyland” on the bottom is missing the bottom half of the I. For realz. If you’re into design, the Designing Disney is your place to go. Not just limited to Disneyland! If you’re not into design, read it anyway because it’s really interesting. DIS is kind of like this giant, huge, mega behemoth Disney site, with like pretty much everything you ever wanted to know, EVER, about all of the Disney parks plus the cruise line, vacation club, and so on. We’re talking EVERYTHING. The drawback, of course, is that it can be kind of intimidating. The link above is to the blog, but the main Disneyland section is here. Also on DIS is the DIS Boards, populated entirely by really nice Disney fanatics loyal fans ready to offer advice and have some fun. You can find me over there every once in a while posting under “MyYearWithTheMouse.” I know you never would have deduced that that poster was me, so I thought I’d throw it in. I’ve posted about Disney On Wheels before including a guest post from Melissa herself. Melissa uses a wheelchair and has a great perspective on the Disney parks experience. Although she goes to the Mouse-In-Law (also known as Walt Disney World, for those of you joining us recently), I love her writing style and commentary. Nothing to do with gorillas, Gorillas Don’t Blog is all about Disneyland history with fabulous pictures and commentary. Knott’s Berry Farm sneaks in there every once in a while, but that’s okay. We love Knott’s too. Just not as much as Disneyland. Did I mention I love Disneyland history and old pictures? Stuff From the Park is another one that can’t be missed in that category. I mean really, since I’m too young to remember the slightly-offensive Indian Village, it’s always interesting to me to see pictures of it. And also he’s got stuff from the 80s recently, which I WAS alive for, and have the pictures of the spiral perm hairstyles to prove it. Me in 1988. The bangs are uninspiring, given the time period, but that spiral perm took HOURS to cultivate. My hair is naturally very, very straight. And seriously, I know I look about 11 years old in that picture, but I was actually 15. What can I say–I was very youthful. So these are a few Disney blogs I love, and I’ll cover some more in subsequent posts. But I’d love to hear from YOU! What Disneyland blogs or sites do you follow? Any good suggestions for me? OMG! You look GREAT, Shelby! You gotta show us some of your cheerleader moves! 😆 I was a flag twirler. Remind me the next time I see you to show off my magic ninja flag moves. Ahhh. a Flaggie! No way would I ever post a picture of myself in my marching band uniform! Thanks for sharing! Oh you know, the colorguard never resists an opportunity to show off ;). All I remember about that uniform is that the sparkly sequined vest was SO HOT in the sun. I think the year after this picture was taken we switched to a new even more embarrassing uniform. 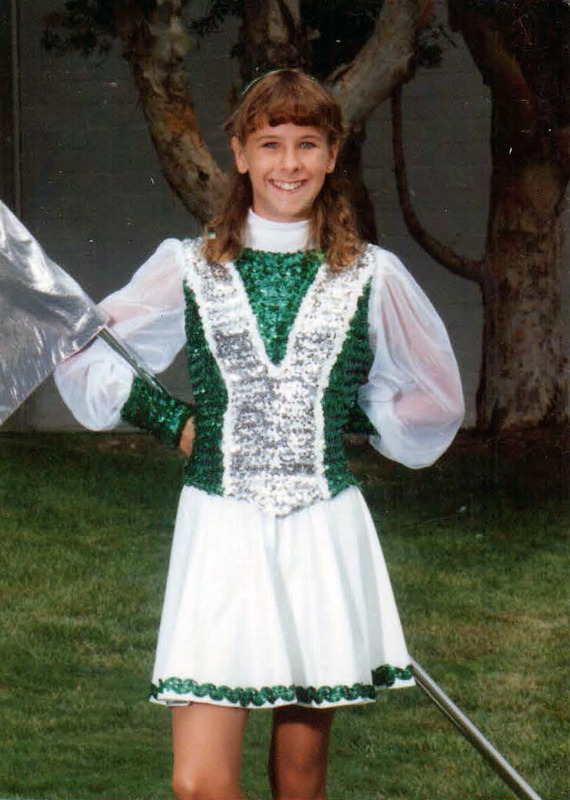 I honestly can’t remember what my high school color guard uniforms looked like.. but I know at ASU for the first year or two they had heavily sequined tops… which, while beautiful, looked terribly terribly uncomfortable. In any event you look great! I am checking out this DIS Board that you mentioned.. holy cow! Lots of good info there too. Thanks so much! Oh and BTW it asked how I heard about the site so I mentioned you. Thanks so much for the mention and kind words – much appreciated! Love your idea for a Bambi ride – I always thought Mary Poppins would make a darn good dark ride, too!